BULATS is an flexible tool that assesses English language skills for business, industry and commerce. BULATS is an affordable way to assess job applicants quickly and accurately. It helps organisations develop a workforce that is confident communicating in international business environments. BULATS is an online test that assesses at CEFR Levels A1 - C2. Important: BULATS will be retired as of December 2019 and will be replaced by Linguaskill Business, available from November 2018. Assess job applicants quickly, accurately, and affordably. Global companies including PwC, Mercedes Benz, Microsoft and Nestlé use BULATS for their recruitment. Select internal candidates with the right English language skills for placement in your overseas offices. It is a flexible test which you can use when and where you need it. identify training needs quickly and economically. The Business Language Testing Service (BULATS) is a rapid, economical and accurate means of assessing English language skills for recruitment, training and staff development. The BULATS test enables your organisation to test employees individually or audit the skills of whole departments. Results are delivered quickly, reliably and accurately. The BULATS test is one of the most recognised workplace English tests in the world and is accepted globally by employers, education institutions and government departments. 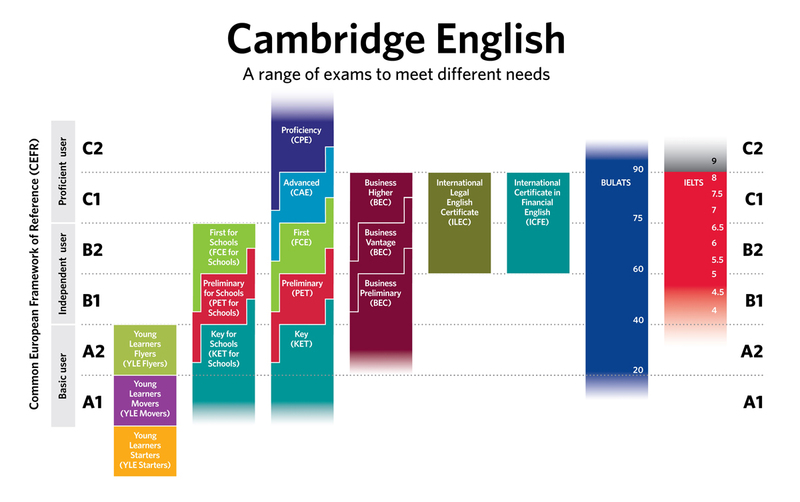 Over 20,000 organisations worldwide trust the Cambridge English range of exams. You can use the tests in any combination to meet your specific needs. The tests can be taken on any computer with a good internet connection. You do not need to download or install any special software. The Reading and Listening module is an adaptive test, so there is not a fixed number of questions. Each question the candidate answers helps the computer to understand their level better. The test finishes when the candidate has answered enough questions to identify their level accurately. The Speaking test is taken on a computer, using a headphones and a microphone. Answers are recorded and sent to examiners for marking. Example topics: buying and selling environment, entertainment of business clients, business travel, human resources, training and development. Part 2 (Reading Aloud) Eight sentences to read aloud. A business or work-related topic (e.g. the perfect office) is given for the candidate to talk about for one minute. The candidate has 40 seconds to prepare. Part 4 (Presentation with Graphic): The candidate is given one or more graphics (e.g. pie charts, line graphs) with a business focus (e.g. company exports) to talk about for one minute. The candidate has 1 minute to prepare. The candidate gives his/her answer to five questions related to one scenario (e.g. planning a conference). The candidate has 40 seconds to prepare. In the Writing test, candidates have to write answers using a computer keyboard. Answers are recorded and sent to examiners for marking. Example topics: buying and selling products and services, the office and general business environment, entertainment of business clients, business travel, human resources, training and development. The candidate types a short email of 50–60 words. One-third of the final Writing mark. Part 2 (Long Text): The candidate types a report or a letter of 180–200 words following instructions. One of a choice of two tasks must be chosen. Two-thirds of the final Writing mark. BULATS results are normally issued within 5 working days for the Reading and Listening module and 7 working days for the Speaking and Writing modules. Candidates receive their result on a computer generated Test Report Form. There is no ‘pass’ or ‘fail’ mark for BULATS tests. Scores are reported on a scale of 1 to 100 – you can decide on the level of ability appropriate to your organisation’s requirements. All BULATS tests are aligned with the Common European Framework of Reference for Languages (CEFR) – the international benchmark for describing language ability. This ensures that candidates’ results can be compared with international standards. BULATS results are presented in a clear and easy-to-understand Test Report Form. You can produce reports for individuals or groups, depending on your needs. You can also produce a breakdown of scores by group and level, allowing easy comparison of language ability across your whole organisation. BULATS results provide a description of what the candidate can do at their specific language level in each skill (reading, writing, listening and speaking). keep up with an animated conversation between native speakers. Candidates decide how many emails they want to receive each week, and Cambridge English then send them free materials to support their test preparation. Follow these steps to take an online sample test. Note: The demonstration test is shorter than a real test and does not provide a result. Find out more about the BULATS test and what to expect on the day. Teachers and administrators are provided with training materials which introduce them to the online Learning Management System and a complete set of printable teacher's notes and classroom activities for each module. To find out more about teaching BULATS and offering BULATS blended learning courses at your organisation or institution, contact the Cambridge English helpdesk. The Cambridge English Online Self Study Course for BULATS provides a flexible and engaging learning experience to help candidates prepare for the BULATS tests. The course is suitable for candidates with English at a minimum of CEFR Level B1. You can hold a BULATS test session at your organisation or at our centre on the date of your choice as long as you have a minimum of 10 candidates. If you do not have enough candidates they can still take the exam at one of our BULATS open sessions. 1. Choose a date for your BULATS session. BULATS tests are on-demand and you can choose the date that best suits your organisation’s needs. 2. Contact our centre. Call us on 934 111 333 or send an email to registrations@exams-catalunya.com with your proposed exam date. Please note that dates must be reserved no less than 3 weeks in advance. 3. Register your candidates. Once we have confirmed your exam date please complete the registration form and send it to us by email to registrations@exams-catalunya.com. You must send the completed form to us and make payment no less than 3 weeks before the date of your BULATS session. 4. We will send you confirmation and an invoice. You will receive all the exam information, instructions and timetables in advance of your BULATS session. Please view our Format tab for the required technical specifications and to check whether your computers have the correct technical specifications to run the tests. Computer room configurations for Online tests can vary and we will discuss this with you in advance of your session. If you hold a session at your organisation you are required to provide headphones for the listening test and/or headphones with microphones for the speaking test. You may also need to provide separator panels. There should be no books, papers or materials under/in the tables/desks. All posters/materials with English on them must be removed from the walls.